When it comes to training Husky puppies, it’s definitely not always easy. In fact, it can be one of the more frustrating stages of your Husky’s life. He doesn’t yet know what’s expected of him and you need to set down the house rules – it’s a 24 hour job! As mischievous as puppies can be, they will bring you more joy than frustration if you take the right steps with training them as soon as you can. Do not wait for a few weeks to start training them; it should begin the minute you bring him home. The most critical time for training Husky puppies is between the ages of 2-3 months old. During this stage, any of the behaviours that they learn will have the greatest impression on them. That is not to say that you can’t train your puppy if he is older than 3 months – it is definitely possible. It will merely take a bit longer and require more repetitions. Because this stage is so critical, it is also crucial that you try your best to prevent unwanted behaviours from becoming a habit for your puppy. Before your puppy can learn the words for commands such as “sit,” “stay,” or “lie down,” he must first learn the phrases for praise and correction. For example, you can use “No!” for correction and “Good boy/girl” for praise. Change the tone of your voice when you use these commands so that your puppy will understand the meaning behind them. When you praise him, use an enthusiastic and higher pitch. When you are correcting him, be sure to use a low, firm voice. After your puppy has understood the meaning of these phrases, you can move on to teaching him other words. When training Husky puppies, avoid relying on treats for praise. By doing so, you will run the risk of your Husky only obeying you when he’s hungry enough for a treat. If you offer a treat every time for correct behaviour, he will associate that behaviour with getting a treat. That is great if he wants a treat or is hungry, but if he’s just had a meal and isn’t as tempted or motivated by the treat, you will have a problem. The important thing to note here is that even if your Husky is obeying you with biscuit training, it doesn’t necessarily mean you’ve earned his respect. In fact, what you’re doing is giving him a choice: is he hungry enough to do what you want him to do? Ideally, your Husky should obey your commands without question, not when he decides he wants to! A common scenario is if your Husky were to start chasing a cat across the street and you try recalling him. Suddenly, the cat seems a lot more interesting to him than the biscuit does. He would be unlikely to stop the chase just to eat a treat in such a situation. 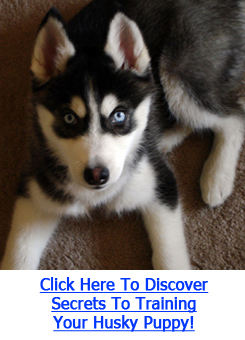 Click Here For Dog Training Secrets – Learn How To Train Your Puppy Properly NOW! Potty training should begin the minute you bring your puppy home. Do not delay with this as any accidents will just prolong the training required. Depending on your preferences and living conditions (house or apartment, etc. ), there are many ways to go about potty training. Crate training is one of the easiest and most effective ways of doing so. If you live in an apartment, don’t have easy access to a yard, or are away from home for long hours, you may wish to try a combination of paper training and crate training. Either way, I would highly recommend using The Ultimate House Training Guide as it is one of the most comprehensive systems and will explain every method in detail.